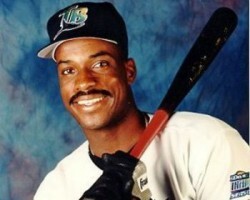 Fred McGriff’s ability to hit home runs has amazed and delighted baseball fans throughout his career. The Tampa Bay Devil Rays first baseman will start his 15th year in baseball at the start of the 2000 season. In that time, he has compiled career statistics that are comparable to those achieved by players enshrined in Major League Baseball’s Hall of Fame. McGriff has enjoyed a career that many major league baseball players only dream of, while conducting himself with a calm professionalism. Taken in the ninth round of the free agent draft by the New York Yankees in 1981, McGriff was traded the following year to the Toronto Blue Jays. That transaction marked the beginning of his workmanlike approach to professional baseball. He toiled in the minor leagues for six seasons, averaging .249 and demonstrating a potential for greatness. After paying his dues in the minors, McGriff eventually graduated to the big leagues. He would quickly make the most of this opportunity. McGriff was named to Toronto’s major league roster in 1986. To improve his hitting abilities, he sought the advice of Blue Jays manager and former slugger Cito Gaston. Gaston taught McGriff to be more patient at the plate, and helped him to overcome his fear of left-handed pitchers. This guidance paid off handsomely for McGriff. After hitting his first major league home run off of Boston pitcher Bob Stanley on April 17, 1987, McGriff quickly established himself as a home run threat. He went on to hit 20 home runs during the 1987 season, which set a club record for rookies. In 1988, McGriff continued to develop at the plate and replaced Willie Upshaw as Toronto’s regular first baseman. He enjoyed a stellar 1988 season. McGriff finished second in the American League with 34 home runs, and second in slugging percentage (.525) and extra-base hits, with 73. He also lead American League first basemen with a nearly flawless .997 fielding percentage. McGriff’s assault on American League pitching continued in 1989 as he led the American League with 36 home runs. This was an especially impressive feat because McGriff battled a slump at the end of the season and did not hit a home run during the last 24 games of the season. On June 5, 1989, he hit a two-run blast against the Milwaukee Brewers that marked the first home run in Toronto’s new ballpark, the Sky Dome. He also drew a total of 119 walks, a Toronto Blue Jays record. 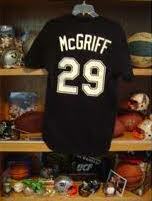 In 1990, McGriff enjoyed another successful season. He hit .300 for the first time in his career and ranked fourth in the American League in home runs with 35. He also reached a career-high in hits (167), and had three two-home run games against Boston, Cleveland, and California. Following the conclusion of the 1990 season, McGriff was traded to the San Diego Padres. McGriff continued to shine in San Diego, thanks to his strong bat and an even stronger chemistry with his teammates. In 1992, McGriff and teammate Gary Sheffield became an intense one-two punch for the Padres. That year, the duo formed the National League’s best home run combination. McGriff batted .286 with 35 home runs, while Sheffield hit .330 with 33 homers. For the second time in three seasons, McGriff led his league in home runs. Despite his consistently stellar performances, he remained humble. As McGriff told Ralph Wiley of Sports Illustrated, “You know what I always dreamed? I dreamed of being a ballplayer. I guess all kids dream that, don’t they? But you know, I dreamed that dream even when I was awake. Now when I hit some of my longest home runs, I don’t even swing hard. How I do it, I don’t know. But baseball will humble you real quick. I stay prepared for that.” In addition to Sheffield, McGriff teamed with Tony Fernandez and future Hall of Famer Tony Gwynn to anchor San Diego’s formidable offense. The four men, who were eventually dubbed The Four Tops, continually punished opposing pitchers. As the Padres entered the final week of the 1992 season, each of The Four Tops was hitting over .300. McGriff began the 1993 season with the Padres. He belted 18 home runs and batted in 46 runs before being traded to the Atlanta Braves during mid-season. The move to Atlanta did not adversely affect his performance at the plate. McGriff blasted another 19 home runs and batted in 55 runs for the Braves, finishing the year with a career-high 37 homers. McGriff smacked 34 home runs for the Braves in 1994, making him just the ninth player in baseball history to hit more than 30 home runs in seven consecutive seasons. By doing so, he joined the elite company of Hall of Famers Babe Ruth, Lou Gehrig, Jimmie Foxx, Ralph Kiner, Mickey Mantle, Eddie Matthews, Hank Aaron, and Mike Schmidt. In addition to hitting 34 home runs, McGriff was named to the 1994 National League All-Star team. He earned the All-Star Game’s Most Valuable Player award when he hit a game-tying homer off of Lee Smith in the ninth inning to lead the National League to a 10-9 win. On June 7, 1994, he hit a career-high five RBIs in one game against the San Francisco Giants. During the last 10 games of the season, he hit seven home runs and batted in 13 runs. At the end of the 1994 season, McGriff placed fourth in the National League in homers (34), RBIs (94), total bases (264) and slugging percentage (.623). During McGriff’s next three seasons with the Atlanta Braves, he hit 27, 28 and 22 home runs respectively. In 1996, he achieved a personal milestone by hitting his 300th home run. By finishing that year with 28 home runs, McGriff achieved his 10th straight, 20-plus home run season. Holds major league record for most grand slam home runs in consecutive games with two, 1991; First player in modern era to win a home run title in both the American and National Leagues, with 36 homers in the AL (1989) and 35 in the NL (1992); named Most Valuable Player in All-Star Game, 1994.